Disability issues have in the past been given less priority in development due to lack of supportive legal framework to encourage realistic intervention strategies. The development of the Convention of Rights for People with Disabilities places a demand on states to be more pro-active in inclusionary disability strategies. This paper tries to join in the middle of debate in literature on inclusion of people with disabilities through mainstream vocational training which is argued to be an effective way of developing economic and social capabilities for people with disabilities. 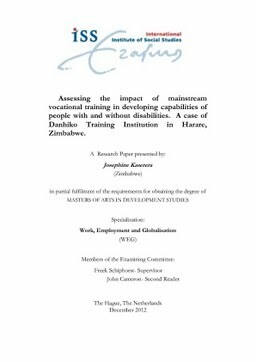 Testimonies of students in disability mainstreaming learning at Danhiko Vocational Training Centre in Harare, Zimbabwe are analyzed using Amartya Sen and Martha Nussbaum’s capability approach, to assess how skills development takes place as well as the capabilities accrued to the students’ lives. This paper will argue that mainstream learning not only has human capital benefits for both students with and without disabilities but that it encourages the development of social capabilities through social interaction for both student categories. This social interaction changes attitudes and stereo-types that encourage exclusion, as students learn each other’s capabilities and get to appreciate that they are differently able.